Javamex News and Development: Which iOS innovations are most anticipated by users? The Javamex companion blog. This blog includes both technical articles relating to the programming information that you'll find on the Javamex site, plus information covering the IT industry more generally. Which iOS innovations are most anticipated by users? At the beginning of last week, Apple made some fairly major announcements for the forthcoming update to its operating systems in what was-- in the words of Apple's CEO-- "the mother of all releases for developers". And it's fair to say that the new features open up a range of potential for new types of applications for Mac-- and for iOS in particular-- that were previously not possible. At some point or other, a release packed with features for developers will hopefully translate into a release packed with new features and applications for consumers. Certain of these features, such as the new Health application which was widely leaked even before the event, appear to have been latched on to by the media despite the fact that they are probably only relevant to a minority of developers. Whereas, for example, CloudKit-- which has huge implications for the ease with which developers can now create a whole class of scalable client-server applications with minimal investment-- appears to be a subject of salivation for developers whose implications have yet to be appreciated by other commentators. But as tech heads, it's still helpful to try and get an ear to the ground when it comes to finding out what matters to users. 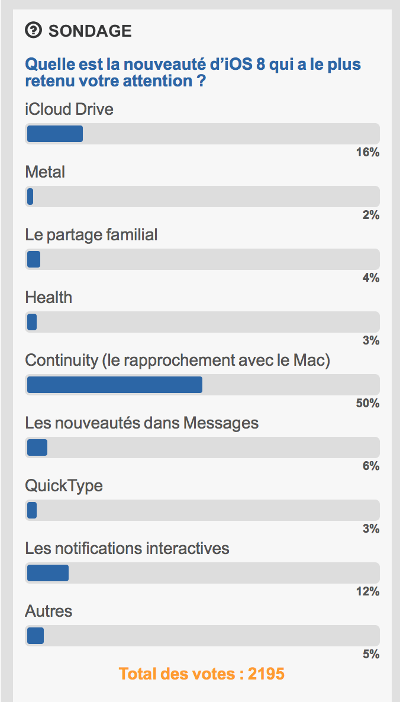 One insight is provided by French site igen, which is currently running a poll among users on which feature they have been most interested by. At present (out of just over 2,000 respondents), the front runners are features at the "business" end of the spectrum: Continuity and iCloud Drive (50% and 16% respectively of respondents selecting these as their preferred feature). Interactive notifications and innovations in the messaging system, despite their swagger-laden demos at the KeyNote, have so far raised less of an eyebrow (12% and 6%). HealthKit receives an extremely low level of interest (3%), perhaps because of a current lack of adoption among health providers in Europe compared to the US (if not because of the fact that data privacy is more firmly entrenched in French law and digital ethos). Unfortunately, the survey did not single out App Extensions, which will effectively enable whole new categories of applications to be developed for the two operating systems. You might not have rushed to incorporate Continuity or iCloud Drive into your apps. But from one informal survey at least, it appears that if you do so, you will be responding to two of the most anticipated features among users. Mac OS "Yosemite" and iOS focus on "continuity"
Get the Hash Collision Calculator widget and many other great free widgets at Widgetbox!